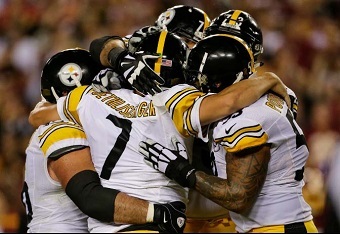 The Secret Service has nothing on Ben’s O-line! The line of Marcus Gilbert, David DeCastro, Maurkice Pouncey, Ramon Foster and Alejandro Villanueva, have been Roethlisberger’s ‘body guards’ on the field, allowing just 17 sacks, the fewest in Roethlisberger’s 13-year career and the reason he is feeling good heading into the AFC Championship Game against the Patriots. Ben Roethlisberger has said it time and time again. It’s no secret. It’s one of the things he says more than anything. While many lump praise on Roethlisberger, Le’Veon Bell and Antonio Brown for the success the Steelers’ offense has had this season, Roethlisberger quickly points out whenever he can that it all starts up front with the play of the offensive line. Roethlisberger said one of the reasons the Steelers not only run the ball so well, but so often, is because it’s what the line loves to do and they are always asking for more running plays. Pouncey and DeCastro were both Pro Bowl selections this season, which should come as no surprise, but Gilbert is one who despite the incredible season he has had, has flown under the radar somewhat. His play has been beyond solid, and he has played through a myriad of bumps and bruises. “When you see him out at practice he looks kind of like RoboCop,” said Roethlisberger. “He’s got his hand bandaged up, elbows, knees, ankles. He’s a banged up guy but he is playing through it all. He fights through it all. You can read & hear more from Ben here. Eli Rogers spent 15 to 20 minutes on the Jugs machine after Friday’s practice. The Steelers slot receiver knows the spotlight will be on all of the receivers on Sunday night in New England, and he wants his hands ready. The Steelers know what to expect from Brown and Bell each week. The rest of the Steelers’ passing game can be an adventure. Tight end Ladarius Green might play but is still in the NFL’s concussion protocol. That leaves Rogers, tight ends Jesse James and Xavier Grimble, and wide receivers Cobi Hamilton, Sammie Coates, Demarcus Ayers and Darrius Heyward-Bey, all of whom have had their bright moments but aren’t stretching the field each week. Rogers is the only player from that group to finish the year with more than 40 catches, but James is perking up, catching five passes for 83 yards in Kansas City last week. The Chiefs left him curiously open, and he took advantage of it. Why does Rogers feel so hopeful about this matchup? He feels encouraged in part by Friday’s practice. Rogers — whose 48 catches for 594 yards are third on the team — said Big Ben spread the ball around. Brown will get his, but the Steelers know if they get open, Roethlisberger will hit them, whether they are stars or role players. “He’s an equal-opportunity quarterback,” Rogers said. Roethlisberger listed several of his receivers by name when asked about his playmakers outside of the big three, including one-catch Cobi — that’s not Hamilton’s nickname, but it might as well be, as Roethlisberger said he makes one important catch each week. Hamilton has caught exactly one pass in five of the last six games, including multiple third-down snags.